Posterior and anterior intercostal arteries are responsible for the blood supply. 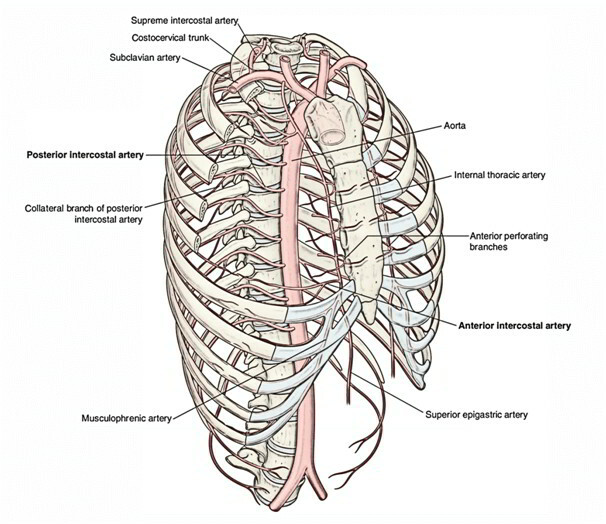 Blood supply is abundant in the thoracic wall. 1 posterior and 2 anterior intercostal arteries (upper and lower) are included in every intercostal spaces. There are 11 pairs of intercostal arteries, 1 in every space. They furnish the greater part of the intercostal spaces. The 1st and 2nd posterior intercostal arteries are the branches of superior intercostal artery – a branch of the costocervical trunk. The 3rd-11th posterior intercostal arteries originate directly from the descending thoracic aorta. The right posterior intercostal arteries are longer in relation to the left since the descending aorta is located on the left side of the front of the vertebral column. They pass behind the esophagus, thoracic duct, azygos vein, and sympathetic chain but in front of the anterior aspect of vertebral body. The left posterior intercostal arteries are smaller and pass behind the hemiazygos vein and sympathetic chain, but in front of the side of the vertebral body. In the intercostal space, the posterior intercostal artery is located between the intercostal vein above and the intercostal nerve below. The neurovascular bundle in the intercostal space is located between the internal intercostal and intercostalisintimus muscles. Costochondral junction by anastomosing with the upper. Anterior intercostal artery of the space. Dorsal branch: It supplies the spinal cord, vertebra and muscles, and skin of the spine. Collateral branch: It appears near the angle of the rib and runs forwards along the upper border of the rib below and ends by anastomosing with the lower anterior intercostal artery. Muscular branches: They supply intercostal, pectoral, and serratus anterior muscles. Lateral cutaneous branch: It closely follows the lateral cutaneous branch of the intercostal nerve. Mammary branches (external mammary arteries): They originate from posterior intercostals arteries of the 2nd, 3rd, and 4th intercostal spaces and supply the breast mammary gland. Right bronchial artery: It appears from right 3rd posterior intercostal artery. During paracentesisthoracis(aspiration of fluid from pleural cavity), the needle should at no time be added medial to the angle of the rib to prevent injury to the posterior intercostal artery, as it crosses the space obliquely from below upwards. In coarctation of aorta (narrowing of arch of aorta), the posterior intercostal arteries are noticeably enlarged and cause notching of the ribs, especially within their posterior parts. There are just two intercostal arteries in every intercostal space. They exist in the upper 9 intercostal spaces only. In 1st-6th spaces they originate from the internal thoracic artery. In 7th and 9th spaces, they originate from musculophrenic artery. The 10th and 11th intercostal spaces don’t extendforward enough to have anterior intercostal arteries. Upper anterior intercostal artery anastomoses with corresponding posterior intercostal artery. Lower anterior intercostal artery anastomoses with collateral branch of the corresponding posterior intercostal artery.